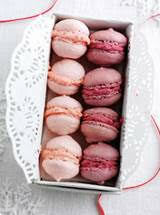 You could try this Macaroons recipe to make a pretty gift for your Valentine. These pretty patisseries are very fashionable at the moment but can be very expensive to buy, so why not make your own and give as a gift in a recycled box lined with non-stick baking paper and a lacy paper doily tied with ribbon. 1.Preheat the oven to 140oC/275oF/Gas Mark 1. Line 3 baking sheets with non-stick baking paper. 2.Grind the icing sugar and ground almonds to a fine powder in a food processor or liquidiser then press through a sieve. 3.Whisk the egg whites in a large bowl until they form moist peaks then gradually whisk the caster sugar in a little at a time. Whisk for 2 minutes until the mixture is thick and glossy, then whisk in a few drops of violet or pink food colouring. 4.Spoon half the icing sugar and ground almonds into the bowl then gently fold together. Add the remaining mixture and continue folding in until just mixed. Don’t over-fold or the mixture will go very runny and be difficult to pipe. 5.Spoon into a piping bag fitted with a large plain tube and pipe 2.5cm (1 inch) rounds on the paper lined trays. Give each baking sheet a sharp tap to ensure a good ‘foot’. You should make about 40. Leave to stand for 20 minutes for the macaroons to dry out. 6.Bake for 15-20 minutes or until the macaroons may be lifted easily off the paper. Leave to cool. 7.For the filling, puree the berries until smooth then press through a sieve. Beat the butter and icing sugar together in a food processor until smooth then gradually beat in 2 tbsp of the fruit puree. Use to sandwich the macaroons together in pairs. Arrange on a serving plate or in a pretty box. ◾Once sandwiched together the macaroons are best eaten within 24 hours. Plain macaroons can be kept for 2-3 days in a cool dry place covered with extra non-stick baking paper and the filling in a covered container in the fridge. ◾You might also like to flavour the macaroons with ½ tsp of raspberry, lemon or peppermint extract when adding the colouring to the meringue. Discover more fruity recipes using Seasonal Berries. Will you be trying this macaroons recipe?